For other people named John Browning, see John Browning (disambiguation). 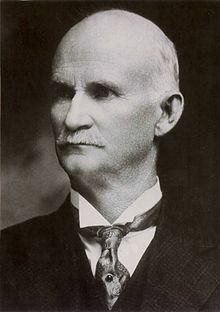 John Moses Browning (January 23, 1855 – November 26, 1926) was an American firearms designer who developed many varieties of military and civilian firearms, cartridges, and gun mechanisms – many of which are still in use around the world. He made his first firearm at age 13 in his father's gun shop, and was awarded the first of his 128 firearm patents on October 7, 1879, at the age of 24. He is regarded as one of the most successful firearms designers of the 19th and 20th centuries, and pioneered the development of modern automatic and semi-automatic firearms. Browning influenced nearly all categories of firearms design. He invented, or made significant improvements to, single-shot, lever-action, and pump-action rifles and shotguns. Arguably, his most significant contributions were in the area of autoloading firearms. He developed the first reliable and compact autoloading pistols by inventing the telescoping bolt, then integrating the bolt and barrel shroud into what is known as the pistol slide. Browning's telescoping bolt design is now found on nearly every modern semi-automatic pistol, as well as several modern fully automatic weapons. He also developed the first gas-operated firearm, the Colt–Browning Model 1895 machine gun – a system that surpassed mechanical recoil operation to become the standard for most high-power self-loading firearm designs worldwide. He also made significant contributions to automatic cannon development. Browning's most successful designs include the M1911 pistol, the water-cooled M1917, the air-cooled M1919, and heavy M2 machine guns, the Browning Automatic Rifle, and the Browning Auto-5 – the first semi-automatic shotgun. Some of these arms are still manufactured, often with only minor changes in detail and cosmetics to those assembled by Browning or his licensees. His guns are some of the most copied firearms in the world. His father Jonathan Browning, who was among the thousands of members of The Church of Jesus Christ of Latter-day Saints pioneers in the mass exodus from Nauvoo, Illinois to Utah, established a gunsmith shop in Ogden in 1852. As was common in the Mormon community at that time, Jonathan Browning was a polygamist, having taken three wives. He fathered 22 children and two stepdaughters, including John Moses Browning with his wife Elizabeth Caroline Clark. John Moses worked in his father's Ogden shop from the age of seven, where he was taught basic engineering and manufacturing principles, and encouraged to experiment with new concepts. He developed his first rifle, a single-shot falling block action design, then, in 1878, in partnership with his younger brother, co-founded John Moses and Matthew Sandefur Browning Company, later renamed Browning Arms Company, and began to produce this and other non-military firearms. By 1882, the company employed John and Matthew’s half-brothers Jonathan (1859-1939), Thomas (1860-1943), William (1862-1919], and George (1866-1948). Like his father, Browning was a member of the Church of Jesus Christ of Latter-day Saints, and served a two-year mission (LDS Church) in Georgia beginning on March 28, 1887. He married Rachel Theresa Child (14 Sep 1860 – 30 Sep 1934) on April 10, 1879 at Ogden, Weber County, Utah Territory, and the couple had 10 children, two of whom died in infancy. Production examples of the Model 1885 Single Shot Rifle caught the attention of the Winchester Repeating Arms Company, who dispatched a representative to evaluate the competition. Winchester bought the design for $8,000 and moved production to their Connecticut factory. From 1883, Browning worked in partnership with Winchester and designed a series of rifles and shotguns, most notably the lever action Winchester Model 1887 and the Model 1897 pump shotgun, the falling-block single-shot Model 1885, and the lever-action Model 1886, Model 1892, Model 1894, Model 1895 rifles as well as the long recoil operated semi-automatic Remington Model 8 rifle, many of which are still in production today in some form; over six million Model 1894s had been produced as of 1983, more than any other sporting rifle in history. Winchester manufactured several popular small arms designed by John M. Browning. For decades in the late 19th Century-early 20th Century, Browning designs and Winchester firearms were synonymous and the collaboration was highly successful. This came to an end when Browning proposed a new long recoil operated semi-automatic shotgun design, a prototype finished in 1898, to Winchester management, which ultimately became the Browning Auto-5 shotgun. As was the custom of the time, Browning's earlier designs had been licensed exclusively to Winchester (and other manufacturers) for a single fee payment. With this new product, Browning introduced in his negotiations a continuous royalty fee based upon unit sales, rather than a single front-end fee payment. If the new shotgun became highly successful, Browning stood to make substantially more fee income over the prior license fee arrangements. Winchester management was displeased with the bold change in their relationship, and rejected Browning's offer. Remington Arms was also approached, however the president of Remington died of a heart attack as Browning waited to offer them the gun. This forced Browning to look overseas to produce the shotgun. However; Remington would later produce a copy of the Auto-5 as the Model 11 which was used by the US Military and was also sold to the civilian market. Having recently successfully negotiated firearm licenses with Fabrique Nationale de Herstal of Belgium (FN), Browning took the new shotgun design to FN; the offer was accepted and FN manufactured the new shotgun, honoring its inventor, as the Browning Auto-5. The Browning Auto-5 was continuously manufactured as a highly popular shotgun throughout the 20th century. In response, Winchester shifted reliance away from John Browning designs when it adopted a shotgun design of Thomas Crossley Johnson for the new Winchester Model 1911 SL, (Johnson had to work around Browning's patents of what became the Auto-5) and the new Model 1912 pump shotgun, which was based in small part upon design features of the earlier Browning-designed Winchester Model 1897 shotgun. This shift marked the end of an era of Winchester-Browning collaboration. John Browning was known as a dedicated and tireless innovator and experimenter who sought breakthrough consumer-oriented features and performance and reliability improvements in small arms designs. He did not retire from his career in his later years, but dedicated his entire adult life – literally to his last day – to these pursuits. On November 26, 1926, while working at the bench on a self-loading pistol design for Fabrique Nationale de Herstal (FN) in Liège, he died of heart failure in the design shop of his son Val A. Browning. Even the 9 mm semi-automatic pistol he was working on when he died had great design merit and was eventually completed in 1935, by Belgian designer Dieudonne Saive. Released as the Fabrique Nationale GP35, it was more popularly known as the successful Browning Hi-Power pistol, a favorite of sportsmen, gun collectors as well as many military and law enforcement agencies around the world. The premium priced Browning Superposed shotgun, an over-under shotgun design, was his last completed firearm design and possibly his most elegant. It was marketed originally with twin triggers; a single trigger modification was later completed by his son, Val Browning. Commercially introduced in 1931 by FN, Browning Superposed shotguns, and their more affordable cousins, the Browning Citori made in Asia, continue to be manufactured into the 21st century, and come with varying grades of fine hand engraving and premium quality wood. Throughout his life, Browning designed a vast array of military and civilian small arms for his own company, as well as for Winchester, Colt, Remington, Savage, Stevens, and Fabrique Nationale de Herstal of Belgium. Browning firearms have been made, both licensed and unlicensed, by hundreds of factories around the world. Browning Arms Company was established in 1927, the year after Browning's death on November 26, 1926 in Liège, Belgium. In 1977, FN Herstal acquired the company. The M1895 Machine Gun saw action in the Spanish–American War with the United States Marines. The Colt M1911, Browning 1917/19, and the BAR saw action with US forces in World War I, World War II and the Korean War, with the M1911 going on to serve as the U.S.'s standard military side arm until 1985; a variant is still used by special operations units of the United States Marine Corps and the design remains very popular amongst civilian shooters and some police departments. The Browning Hi-Power has a similarly lengthy period of service outside the United States, and remains the standard side arm of the Australian and Canadian armed forces. The M2 Browning machine gun, the timeless .50 caliber "Ma Deuce", which was developed in 1918, entered service with the US Armed Forces in 1921, and remains in active service for nearly a century with armed forces across the world in a variety of roles. The M4 cannon, a 37mm autocannon, was initially designed by Browning in 1921, and entered service in 1938; it was used both in aircraft and on the U.S. Navy PT boat during World War II. ^ Pelley, Doug (July 2004). "Pictures of Headstones: John M. Browning". Dapcom. Retrieved 23 January 2007. ^ Borth, Christy (1945). Masters of Mass Production. Indianapolis: Bobbs-Merrill Company. pp. 152, 156–9. OCLC 609185692. ^ Rattenbury, Richard C. "John Moses Browning". Encyclopædia Britannica. Encyclopædia Britannica, Inc. Retrieved 22 September 2018. ^ Browning.com "In Honor of the Parents of "the Father of Modern Firearms." Retrieved September 5, 2018. ^ "Early Mormon Missionaries: John Moses Browning". ^ Browning "Honoring 'The Father of the Browning Company. '", Browning.com. Retrieved September 22, 2018. Browning, John, and Curt Gentry. John M. Browning, American Gunmaker. New York: Doubleday, 1964. OCLC 1329440. This page is based on the Wikipedia article John Browning; it is used under the Creative Commons Attribution-ShareAlike 3.0 Unported License (CC-BY-SA). You may redistribute it, verbatim or modified, providing that you comply with the terms of the CC-BY-SA.